In 1989, film history Tom Gunning wrote a highly influential essay entitled “The Cinema of Attractions: Early Film, Its Spectator and the Avant-Garde.” Mr. Gunning examined how film historians had written about the early yore of silent cinema and its push toward narrative cinema. But he proposed that the attraction of the works of Thomas Edison and the Lumiere brothers was not based on seeing stories, but seeing things move. The cinema itself, the spectacle of movement, was its primary attraction. Stories came later; cinema was born out of this attraction of the possibilities of cinema could show or do anything we could think up. It is this love of spectacle that has obviously drawn Martin Scorsese to make one of his most ambitious, pictures of his career and one of his most self-conscious films. Hugo, an adaptation of a young adult novel by Brian Selznick looks like a strange departure for a director as it follows a story of a child in somewhat of a fairy tale. But Hugo is much more than that, a bold, genre-crossing picture that is both narrative and spectacle, and ultimately a film essay on the importance of the origins of cinema, and the need to preserve classic film as well. 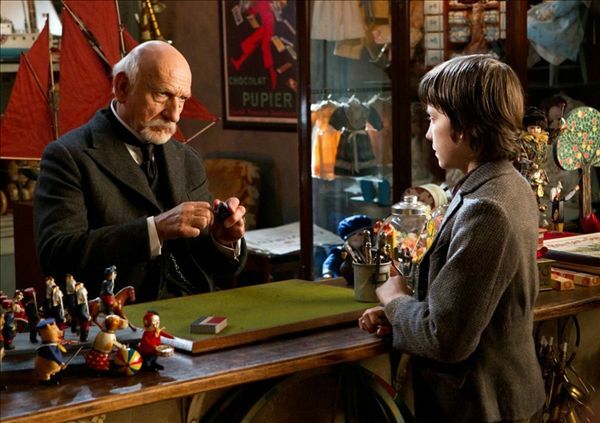 The first thirty minutes of Hugo doesn’t exactly hint at any sort of reflexive story, however. In a mostly silent prologue, Mr. Scorsese zooms his camera through the landscape of a Paris train station, full of characters and quirks. It’s the 1920s and young Hugo Cabret (Asa Butterfield) lives among the clocks of the train station while avoiding the detecting eyes of a bumbling but stern inspector (Sacha Baron Cohen) on the hunt for orphans like himself. As he winds the clocks of the gargantuan station, Mr. Scorsese takes us through the gears and lights that make the things turn, an obsession with not only the bigger picture but the ones inside as well. Hugo’s main goal is to rebuild an anatomical robot that he believes contains a secret message from his dead father. The only way to get the pieces, though, is to steal than from a mysterious man in a toyshop. That mysterious man, played effortlessly by Ben Kingsley, holds a dark secret that not even his adopted daughter (Chloe Grace Mortez) knows about. As Mr. Scorsese brings us through the early machinations of the plot, he keeps his pace a little more staid and stilted than usual, though some might develop from the performances as well; Mr. Butterfield hasn’t developed into a natural actor yet, and Ms. Mortez has become too comfortable playing years beyond her actual age to really play a child. The comic pieces with Mr. Baron Cohen, a natural actor of the buffoonish, also feels oddly out of place, especially when Hugo opens up from simply a child’s adventure to a wondrous story about the early ages of cinema. Those who know Mr. Scorsese well know that he is as much film historian as filmmaker and has worked diligently with Film Foundation to restore important classics that are diluted and forgotten by the age of time (he has recently began touring a gorgeous new print of the Powell & Pressburger masterpiece The Life and Death of Colonel Blimp). 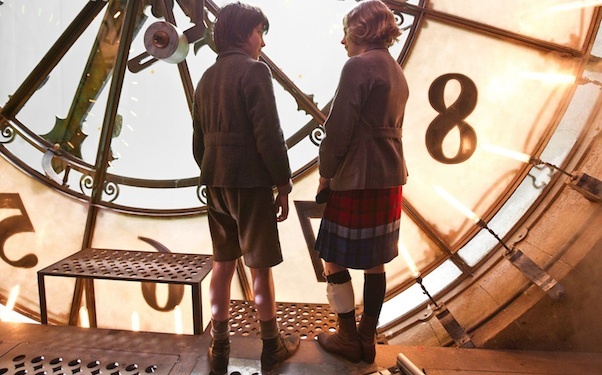 So it makes sense that clocks populate the world of Hugo, as time is the enemy for old cinema, and the people we least suspect are the masters of the past. Soon, Hugo learns about the Lumiere brothers, the Edison shorts, and, most importantly, Georges Méliès, the filmmaker behind many fantasy films, including A Trip to the Moon. While some have read Hugo as basically the most expensive advertisement ever produced for Film Foundation, Hugo delights itself in helping us understand the magic of classic cinema. Mr. Scorsese ends up recreating many of the Méliès shorts in his films, popping them up with color (the old films were tinted by hand) and really showing off the spectacle and the fun of watching them. Hugo says that his father thought cinema showed him his dreams in waking life, and watching how much Mr. Scorsese indulges in these images proves that point. As much as the director is going back in the past, Mr. Scorsese heads toward the future of cinema as well. Shooting in digital 3D, Mr. Scorsese’s world might be the past, but its alive with such color and depth that looks much more alive than any other film today. This of course thanks to the great work of Mr. Scorsese's collaborators: production designer Dante Feretti and his epic sets, the gorgeously rich lighting of Robert Richardson, and the editing of Themla Shoonmaker. The 3D effects are mostly subtle and not particularly jaw-dropping, except for a moment when he recreates the famous shot from A Trip to the Moon, with the moon popping out of the screen as the spaceship crashes into it. The reason for such antics from Mr. Scorsese seems simple—cinema is a spectacle, and the act of watching movies, of seeing movement, fantastic worlds, gigantic sets, or flat images popping out of the screen, is what attracted people to the movies at first. It makes sense that Hugo is actually a child-fantasy picture, because it is children who understand this primordial love of cinema, where anything is possible. Hugo is the type of film that cinephiles will be remembering for generations to come. We’ll show our children why we don’t just watch the newest Hollywood products, but instead delve into the real life documents of cinema verite, the wondrous world of Technicolor, the glamour of classic Hollywood, and, before all that, the fantastic spectacle of the first moving pictures.